IN EARLY FEBRUARY, a small group of thoughtful people from several islands convened to discuss participation in the Asia Development Bank Conference. An organization known as 'Aha Ho'okele - Huliau (Steering Committee - Time of Change) was formed and a work program devised in an effort to take Hawaii's role in ADB to a higher level. >> Building bridges between diverse individuals towards a common purpose -- combining establishment and activist goals with government and international objectives. >> Assurance of peaceful protest, safety and civil discourse for all the people of Hawaii, and especially for Native Hawaiian people. >> New ways of looking at economic and social independence, particularly through socially responsible investment. >> Celebration of Hawaii's proud accomplishments and ancient culture within the context of the AsiaPacific region. >> Participation by our kupuna (elders) and supporters in sharing knowledge, wisdom, resources and solutions to 21st-century concerns. >> Introduction and leadership by Na Kupuna o Hawaii. About 70 kupuna and supporters from five islands provided spiritual guidance to the proceedings of ADB, operating from a headquarters in the exhibit hall of the Hawaii Convention Center. This included political artifacts and historical documentation, cultural displays of implements, arts and crafts, practitioners and teachers and students. ADB President Tadao Chino rendered what seemed clearly to have been enthusiastic support. Our kupuna quickly became the heart and soul of the forum, spreading the aloha spirit and creating a sense of ease, enjoyment and anticipation. >> 'Aha Ho'okele produced a 212 -hour seminar attended by senior delegates as well as community leaders of Hawaii. The seminar focused on role of the United States in ending recognition of the international status of the sovereign nation of Hawaii and its effects on the Hawaiian people. It explored opportunities to manage Native Hawaiian trust assets, introduced the concept of socially responsible investment, and fostered discussions of Hawaii's future leadership in the Asia-Pacific region. >> Cultural displays on the accomplishments of Hawaii's people in sustainable agriculture and land management (ahupua'a), problem solving (ho'opono), celestial navigation and ocean voyaging (holoka'i), respect for elders and spiritual communication (aloha) spanning two thousand years of Hawaii's history. These displays were coordinated by historians and volunteers in cooperation with the Bishop Museum. 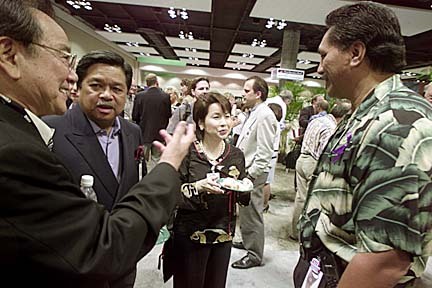 It seems that many of those at the conference were unaware of Hawaii's sophisticated indigenous resources. We believe these efforts were unprecedented demonstrations of inclusivity, harmony, mutual trust, respect for cultural growth and integrity, and listening to each other. We salute the integrity and purpose of all participants -- delegates, protesters, police, media, business and social advocates, government leaders, academics, event organizers, workers and volunteers. Next time, we can sit down together in this recognized place of safety and dignity to make an even better plan, without fear and with open hearts in celebration of our good fortune as keiki o ka'aina. As noted by President Chino, Governor Cayetano and Treasure Secretary O'Neill, Hawaii showed the world how to "make a rainbow." The authors are members of 'Aha Ho'okele - Huliau.